During 2014 and 2015, Clearwater engaged with a variety of stakeholders to build awareness of IWM, and importantly, identify IWM capacity needs from a range of industry perspectives. This conference paper (and associated powerpoint presentation) was presented at the 2015 WSUD conference held in Sydney. 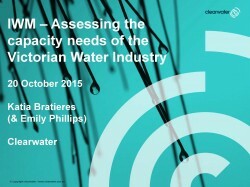 It summarises the extensive research undertaken by Clearwater and sheds light on some of the most important current capacity needs of the water industry.